The high quality raw materials make up the richness of this top-fermented beer, which is characterized by its ocher blonde color. 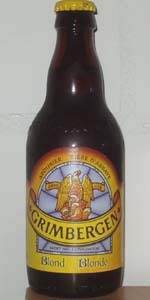 Grimbergen Blonde is light fruity and balanced sweet-bitter. Due to its rounded flavor, this beer is highly appreciated. Arras 2019. Slightly hazy gold with a good head. Fruity Belgian nose with some dampness to it. Lighter body with some overripe fruit notes. Pas mal! Pours a clear golden color with a dense frothy and lathery layer of head. Great retention with lots of sudsy lacing. The aroma is somewhat vinous and cider like with notes of white grape and several other fruity esters including pear, peach and green apple. Lightly tart lemon merengue aromas are complimented by spicy phenols, cloves, nutmeg and a hint of white vinegar. Malt aroma evokes pie crust. The taste opens sweet with an emphasis on bready, pie crust and dry cracker malt and fruity esters. Notes of white grape, green apple, pear, peach, apricot, orange peel and lemony tartness. Little to no hops bitterness, instead there is a light earthy spice and phenols, including notes of pepper and clove. Medium to light bodied with a dry finish. The carbonation is moderate and on par. I thought this was an easy drinking blond ale that had lots of fine Belgian yeast character. I think it’s slightly underrated and should score higher. Una sorpresa. En su aroma destacan el caramelo y un toque frutal. De carbonatación media. Al paladar es dulce pero está bien equilibrada. Una buena opción. Pours foamy, fluffy lace with nectar/gold color. This is a light tasting beer with fruity overtones balanced off with sweet flavoring and yeast. Faint hop and bitterness. Carbonation moderate and pleasing. Nice smooth caramel-toned finish. I can't say that it's memorable but is in line with what you'd expect from a Belgian blonde overall. Capped: Clear dark golden color with moderate activity. Foamy and light creamy white 3 finger head, lasting around 10-15 minutes, with generous legs and decent swirl reaction. Flavors of sweet barley, caramel, wheat, apples, apricot, Belgian yeast, and herbal hops. Slick and oily medium body with a moderate crisp. Medium strength finish, mostly some maillard effect and almost bready, a bit leafy and yeasty, shy fruity feel. Very slightly vinous while more alcoholic, so the freshness is alright. Way too much caramel and not attenuated enough. Lacking some complexity and texture, feels a bit bland and uninteresting. Overall above average quality craft. Bottle. Golden amber. Dense white head. Nice lacing. Interesting aroma of yeast and grain. Esters abound. Spicy. Tastes of cloves. Gentle bitter completion. Quality craft option while visiting Poland. Seems to be readily available in Warsaw.